I'm having trouble tightening the pipe union nuts on some new bath taps I've fitted at my mum's house. I got everything out OK, and (because the previous plumber had put the hot tap on the right rather than the left) I used flexible pipes to connect the taps to the pipes so I could cross them over to put the hot on the left. I chose push fit connectors for this part because of the limited access and those connections went on with out a hitch. 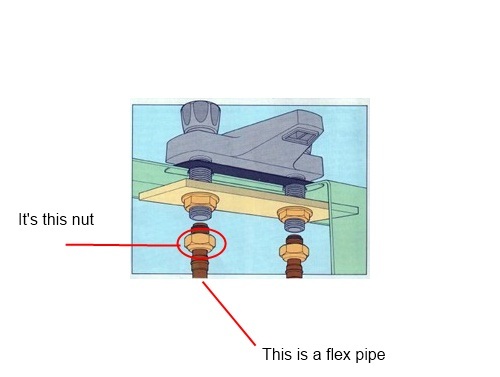 In case I've got the terminology wrong the above is a diagram of a typical tap installation with the offending nut highlighted. The union nuts at the tap are causing me problems because of the restricted access and limited space. I can't get enough purchase to tighten them using any of the wrenches I already own. For tightening taps without isolating the water supply. Adjustable jaws allow for access to both the pipe union nut and the tap back nut with the same spanner. I think that it is the jaw dropper wrench but I've never heard of those before. I have heard of a basin wrench but always assumed that they were for tightening or loosening the nuts on the plug hole. So before I buy something I really only need for one job I ought to make sure I get the right tool. Looking at the diagram, I believe you want a basin wrench. It's designed exactly for these bolts in these tight conditions. And the next time you go to replace a sink, you'll be glad to already own one. That said, I've never heard of, nor seen a jaw dropper plumbing wrench, so I was hoping that someone with more plumbing experience would chime in. What do the nuts look like? Instead of using a basin wrench, I use a modified PVC pipe, the same width as the nut. The nuts typically have four thumb tabs for tightening. Held vertically, I run the PVC pipe over the blade on my tablesaw, forming two matching slots. Push the pipe up onto the nut with the slots lined up on the tabs, viola... perfect fit and cheap solution. Not the answer you're looking for? Browse other questions tagged plumbing tools bath taps or ask your own question. 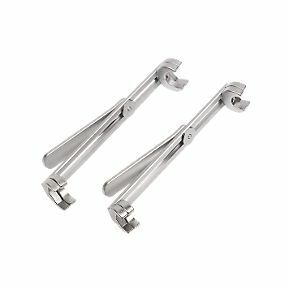 Alternative to a basin wrench? 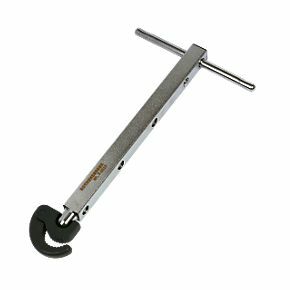 How can I loosen a hard-to-reach square nut whose holder is broken?